RNA toxicity from the ALS/FTD C9ORF72 expansion is mitigated by antisense intervention. J. Donnelly, P.W. Zhang, J.T. Pham, A.R. Haeusler, N.A. Mistry, S. Vidensky, E.L. Daley, E.M. Poth, B.N. Hoover, D.M. Fines, N. Maragakis, P.J. Tienari, L. Petrucelli, B.J. Traynor, J. Wang, F. Rigo, C.F Bennett, S. Blackshaw, R. Sattler, J.D. 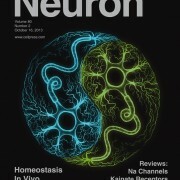 Rothstein (2013) Neuron 80 (2): 415-428. Increased expression of glutamate transporter GLT-1 in peritumoral tissue associated with prolonged survival and decreases in tumor growth in a rat model of experimental malignant glioma. Sattler R, Tyler B, Hoover B, Coddington LT, Recinos V, Hwang L, Brem H, Rothstein JD. J Neurosurg. 2013 Oct;119(4):878-86. doi: 10.3171/2013.6.JNS122319. Epub 2013 Aug 2.